So, 2012 is turning out to be quite a stellar one for Charlie Trotter's alums. Former Trotter's Executive Chef Matthias Merges opened Yusho in the winter. Bill Kim debuted his third restaurant, belly Q, in late August. Graham Elliot opened G.E.B. also in the summer, and Curtis Duffy is set to open Grace later this fall. Also tossing his hat into the ring of rock star spots is Alain Njike, who opened Alain's Restaurant in the South Loop in early August. But what sets Njike apart from the others is that he's bringing a cuisine to Chicago that's never been done before—particularly on an upscale level. His contemporary American menu is highly influenced by flavors from his homeland on Africa's West Coast. 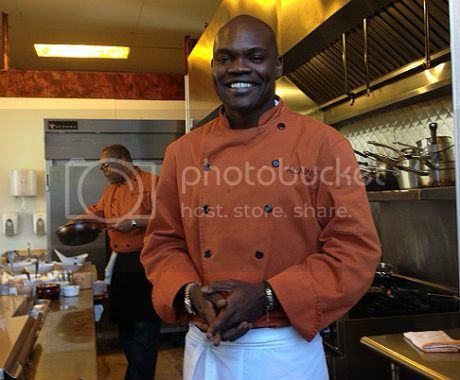 The Cameroonian-born chef boasts a fine-dining pedigree, with training at Ecole Maxime de Paris, which eventually led him to Trotter's for a six-and-a-half-year stint in the front of the house. 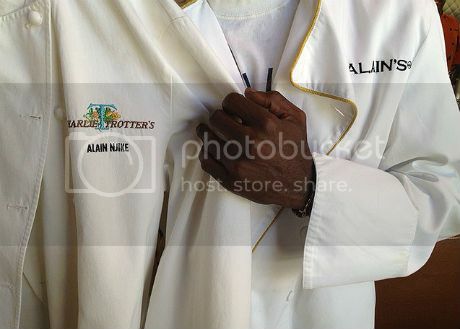 "Charlie Trotter is like a father to me," Njike said, as he proudly displayed his Trotter's chef jacket with his name stitched in black. Amazingly, the jacket is still crisp and white. "I am looking forward to the day when he dines here." Following Trotter's, he landed at NoMI, where he worked for a couple of years, then Park 52 up until he opened Alain's. Njike's restaurant (which he owns with the Nigerian-born Chicago Bears defensive end Israel Idonije) is situated in the center of the South Loop's hot restaurant strip that includes newcomers City Tavern, Square One and Waffles. The area is bustling with a new energy and residents hungry for places beyond the usual sports bars serving mediocre food, so his timing to open Alain's was on point. Though the menu offers classic American fare with Wagyu burgers and steaks, Rotisserie chicken and mac 'n' cheese, the house-made seasonings and sauces are what take the dishes to the next level. Njike makes them with Cameroonian-influenced accents that are spicy and eliminate the need for salt. The signature Eto'o Fish is the "fish of the day" special (usually halibut) that's slathered in the special seasonings, then grilled and complemented by creamed corn and crawfish. There's also the warm beet salad that comes with goat cheese, spinach and drizzled with an African garden sauce. Another highlight is Africa By Night, the Rotisserie chicken with crispy plantains. Njike also pays direct homage to his homeland with creamy Bamilike potatoes, which come with the Wagyu beef. (The Bamileke people inhabit the highlands between the Mbam and the Noun rivers.) There are a few options for vegetarians, including the red beet risotto, chef's garden salad with grilled Romaine and onions, and the aforementioned warm beet salad. Another distinct element you'll find at Alain's is the chef's table, which is located in the kitchen. With about six to eight seats, it offers diners a chance to see all the action right up close. There's also a full wine list (with seven South African offerings) and seasonal cocktail menu. My favorite was the Autumn Falls Sangria, which was tasty with red wine, spiced brandy and brandied cherries, but I would have loved it even better had Njike added some of his special spices to the mix. For now, the restaurant is only open for dinner, but plans are underway to launch brunch and lunch in the fall. Prices range $13-$28 for entrees. What is going on with Alain's? I walked past it this morning, and a green city "no tresspassing" sign was on the door! What is going on with Alain's? I walked past this morning, and a green city "No Tresspassing" sign was on the door! What Is Going On Over At Graham Elliot's? !